If you’ve spent much time in the world of browser games, you’ve probably seen at least one of two links to the Papa’s Games. These games are ubiquitous, taking place in many settings and always challenging players to put their skills to the test. If you’ve somehow managed to avoid playing one of these games by this point, you’re missing out. Fortunately, you can play them all in one place and catch up on a great series. 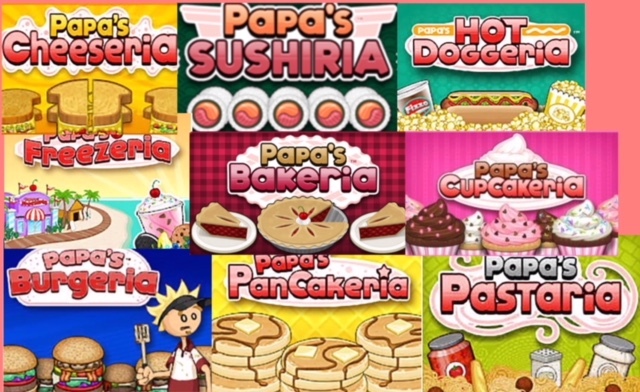 The Papa’s Series of games are time-management games that put players in the role of a fast-food employee. Each game takes place in a different setting. The original game started with pizza, but new games have moved on to sushi, ice cream, pies, and even ballpark concessions. Each entry in the series follows the same basic formula – get an order from a customer, prepare it to his or her liking, and get the item out before your customers get upset about the wait time. In between many of the newer games are simple mini-games that allow you to earn money and players can spend their wages on upgrades for the restaurants that make the higher levels a bit more manageable. What’s really awesome about these games is that they continue to add new mechanics with each iteration. Papa’s Pizzeria was a solid time-management game that had great mechanics, but even it seems fairly basic compared to the latest releases. Moving to multiple screens, multiple product lines and new forms of decor has really allowed this sub-genre of games to avoid becoming stagnant. In fact, it’s almost a guarantee that players will find a challenging new mechanic and a few great twists on the old formula every time they try out a new game. In addition to the restaurant games, there are also the Papa Louie platformers. These games are actually a fair bit deeper than one would imagine, with each player character unlocking new stage routes and changing up the game-play a bit. Honestly, this is more than one can expect from even a dedicated platformer franchise these days, but the Papa Louie side series continues to get better with each edition. If you’re looking to play around in a world with the same general aesthetic at the mainline games, this can be a great way to spend some time. The more you’ve played the other games, though, the more you’ll appreciate the worlds of these games. In short, the Papa’s games are some of the best examples of what you can do with a browser-based game. They’re fun, they’re colorful, and they’re just challenging enough to allow gamers of all skill levels a chance to feel a sense of accomplishment. Whether you’ve never played one of these games or you’re an old pro, you owe it to yourself to launch one of these games and see how your time-management skills add up.